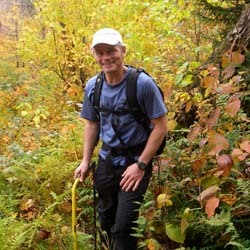 Treeskier.com is a private endeavor to promote the adoption of forest management programs at eastern ski areas. Powder skiing and trees are inextricably linked in eastern ski areas. Located at elevations below 4000 feet, the eastern ski experience is defined by the forest. Trails are artificially maintained breaks in the forest. The forest edges catch and hold natural snow on the trails, trees hold the thin mountain soils in place preventing landslides, and trees are fun and challenging to ski through. Coordinator: Mad River Mountain Work Days, 1995 - present; and Bolton Valley Touring Center, 2009-present. Employment: City of Burlington, Vermont - Information technology, database management, and web site maintenance. Skiing: First strapped on Northland wooden skis in 1964, and have skied ever since.